Luke Runyon visits a beaver meadow in Rocky Mountain National Park. We trudge through the type of mud and muck that grabs your boots and throws you off balance. I grab hold of some branches to steady myself. “You can probably tell they cause a lot of sediment deposition and we’re stepping through all that right now,” she says with a laugh. “There’s a really shy group of beavers that live here,” Scamardo explains. Moving through the meadow is like walking on a massive sponge. The ground is squishy, alternating between wet and dry patches. No two steps are quite the same. We wade through a creek just downstream from a beaver dam, one of many in this stretch near the headwaters of North St. Vrain Creek. Without the beavers’ work, their engineering prowess, this diverse wetland wouldn’t be here. The valley bottom instead would slowly transform back into a grassy plain and the stream would return to its banks, cutting deeper into the landscape, Scamardo says. The whole ecosystem would suffer. Scamardo is a master’s student at Colorado State University, studying how beavers alter landscapes. At one point, the rodents numbered in the hundreds of millions in North America, changing the ecological workings of countless streams and rivers. As settlers moved West, they hunted and trapped them to near extinction. Now there are new efforts — not just in Rocky Mountain National Park, but across the Western U.S. — to boost their numbers, and in turn, get us more comfortable with the way they engineer rivers and streams. Colorado State University students Juli Scamardo and Alex Brooks are researching the effects of beaver dams on water quality and stream health. Heavy snow melt runoff from the jagged peaks of the Front Range frequently undoes all their hard work. On the main creek, away from the marshy wetland, Alex Brooks, a Colorado State University watershed science PhD student, points to a beaver dam made of willows, mud and aspen branches. Last year, the creek blew out the dam. And now it’s back. “So they were homeless for a little while,” I say, not fully understanding the mechanics of beaver habitats. “Yeah, I think that’s probably true,” he says. Much like us, beavers build dams for their own benefit. They make ponds to protect their lodges and flood areas to increase the vegetation they feed on and use for building materials. While their motivations are selfish, they end up helping their woodland friends, like elk, moose, birds, fish and insects. Beaver reintroduction projects are already underway in Nevada, Utah, Wyoming and Washington state. Sections of Rocky Mountain National Park, and vast swathes of the American West, seem primed for a beaver comeback, Scamardo says, but they’re not showing up. The idea of using beavers to help with some of the West’s water problems is popping up in unexpected places. At an April water symposium in Denver, gubernatorial candidates took the stage to explain their natural resource platforms. Libertarian Scott Helker followed a string of candidates who pledged support for Colorado’s statewide water plan and the made requisite promises of finding a balance between new reservoirs and conservation. Libertarian candidate in the Colorado gubernatorial race, Scott Helker, addresses the crowd at the Water in the West Symposium. At a handful of forums throughout the state, Helker’s been using his platform to tout the benefits of beavers. In fact, beaver reintroduction is one of the main planks of his campaign, alongside a pension plan and police reform. Helker’s ideas elicited giggles and scoffs from the room of water wonks at the Denver forum, a common reaction to his less conventional talking point, he says. Bringing beaver into areas that haven’t seen them in a long time might seem novel, but it’s been done quite a few times already, with bursts of beaver relocation activity recorded in the 1930s, the 1950s, and the 1980s. Not long after World War II the Idaho Department of Fish and Game redistributed beavers throughout the state using a unique approach. Scott Helker says he wouldn’t need such a flashy method. In the libertarian mold, his beaver plan includes removal of onerous water regulations that create barriers to beaver reintroduction. Plus, he says he would instruct state wildlife officials and encourage local open space departments to prioritize beaver programs. “So would you say you’re the candidate not just for the people of Colorado but the beavers as well?” I ask. Juli Scamardo stands next to a beaver dam analog on Fish Creek in Estes Park, Colorado. These human-made dams meant to mimic the work of beavers are being used to restore portions of the flood-ravaged waterway. Ellen Wohl isn’t laughing at Helker’s beaver fandom. Ellen Wohl, a Colorado State University geoscience professor, says beavers can help restore streams. “There are lots of places where we can’t reintroduce beaver because there’s just too much urbanization and the river corridor is too constrained,” she says. But to truly see the benefits beavers can bring, says Wohl, we’ll need to rethink our concepts about the animals themselves. State laws across the West classify beavers as a nuisance, a creature that causes problems like flooded basements, dammed culverts and gnawed up trees. Trapping them isn’t regulated like other game species. If a beaver is up to no good on your property you can kill it, no questions asked. “There are a lot of ways to live with beaver, but you have to be willing to think about those or to think about other alternatives rather than killing the animals,” Wohl says, noting the proliferation of pond levelers that allow property owners to lessen flooding without killing the beavers that cause it. And it’s not just our ideas about the animals themselves that are problematic, says author Ben Goldfarb. Before writing his book Eager: The Surprising, Secret Life of Beavers and Why They Matter, he didn’t realize the profound effects beavers have on waterways. Goldfarb spends much of his time in western waterways casting his fly fishing rod. “My conception of what a stream should look like was basically wrong,” Goldfarb says. When beavers were in abundance, before settlers showed up and trapped them for the booming fur trade of the early 1800s, western streams would’ve been a mess, in a good way. Beaver dams, ponds and wetlands would have occupied the channels we know as the clutter-free rivers and creeks of today. 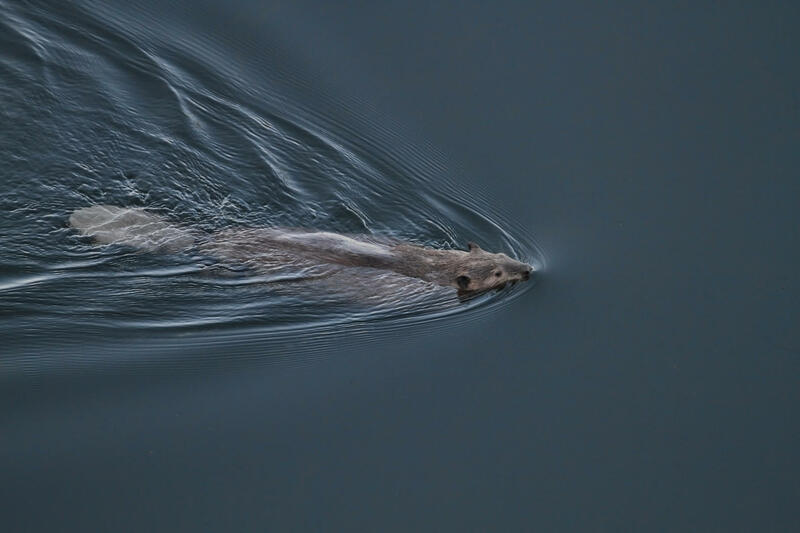 “These sorts of beaver-influenced watersheds are actually in many cases more natural than the classic, shallow, clear riffle stream that people like me like to fish,” Goldfarb says. A new safety campaign from Colorado State University’s communications and natural resources departments is teaching national park visitors about safe selfies. The Safe Wildlife Distance program includes educational materials for park staff, as well as ads and social media campaigns explaining how to get a good photo of wild animals without putting yourself -- or the animal -- at risk. Climate Change Is Making Droughts Worse In The Western U.S.
A new study from NASA reinforces the idea that droughts are getting worse and could become more frequent in the Western U.S. The culprit is human-caused climate change.